Facing an error sometimes will be very annoying. One of errors that you can face when you root your phone is the rooting keeps failing. It can make us panic and do not know what to do. So, what are actually the actions to avoid this error? What are the causes of it? 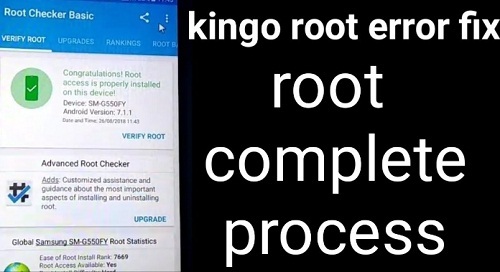 Well, to avoid the rooting process is failed when you are using Kingo Root, you are able to do the things below. Rooting process will probably take you a long time. So, you need to make sure that your battery is charged to at least 80% but even it is better if your battery is 100%. Before you root your android, it is necessary for you to back up data to prevent from data loss if it fails to root. You have to make sure that you have downloaded and installed the correct driver for your android. There are several reasons of why a failure may happen in rooting process. It can happen because the version of the rooting system unmatches with your phone model. You need to know that there are different versions of rooting system that can match different version of the android and phone models. If you do not get the compatible version of root tool to your phone, it can make the rooting process of your phone is failed. The failure of rooting can also be caused by the root package. Most android devices support OTA or ICS upgrade, you are able to copy OTA and ICS to the SD card and upgrade them. You are able to root your Android by means of flashing your phone. The recovery mode can make your device failed in rooting process. Some rooting tools need you to flash your phone under recovery mode. If you fail after attempting for many times, you are able to enter the recovery mode before you root your device. Hit the “Volume -” and the “Power” button simultaneously for a while and then you are able to enter the Recovery Mode. The phone driver can be the cause of failing when rooting process. A lot of rooting tools work unless it is connected. You need to install the phone driver before you root your device. The PC system is another reason why rooting process is failed. Several rooting tools work when flashing the phone under Windows XP mode. So, to avoid the failure when you root your device, make sure that you do several things above. If you want you know other things related to root process, you are able to read other articles in this site. Related Post "Kingo Root Keeps Failing"